Luggage space in the BMW i8 is abysmal. 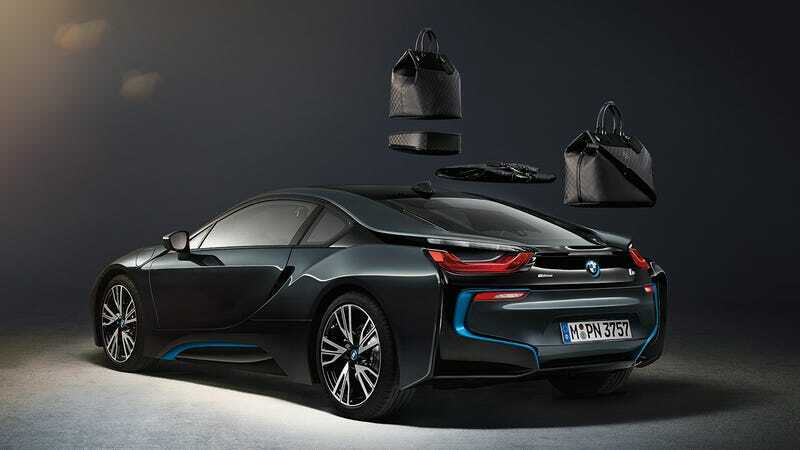 But Louis Vuitton is here to save your weekend jaunt to Monaco with a five-piece set that costs $20,000 — a 15 percent premium over the $135k base price of the i8 — and it doesn't even levitate. All mid-engine sports cars suffer from limited room, and with the i8, it's exacerbated by the electric motor up front. With only a shelf above the turbo'd three-pot and a few slabs of leather masquerading as rear seats, it's not as constricting as the McLaren F1's gerbil storage compartment, but it still ain't great. Enter Louis V and it's "exclusive carbon black" with "chequered Damier pattern" and "laser-etched Louis Vuitton signature." That's right. Despite the BMW's trick carbon fiber monocoque and the luggage's insane price tag, they're not using the lightweight weave.